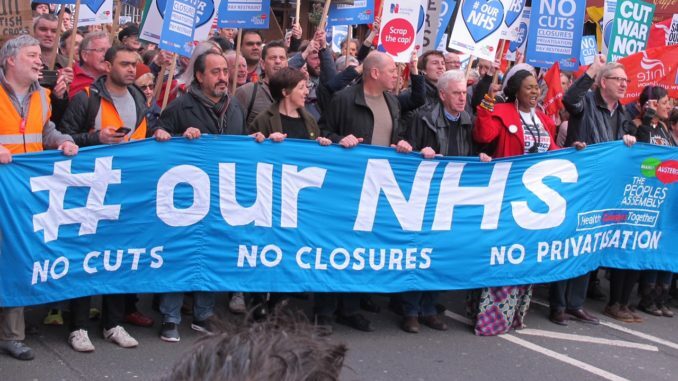 Health Campaigns Together organised the biggest-ever demonstration in defence of the NHS in London on March 4 in collaboration with KONP, Peoples Assembly and with backing from a dozen unions. Now Health Campaigns Together is building for a great conference of NHS campaigners to organise the fightback to save the NHS. Your role: But the most important contributions will come from you and the delegates. It is absolutely essential that we hear from you and we urge you to come and share your experiences, ideas, strategies and vision with like-minded others at this conference to build pressure against a collapsing Government. We expect this to be an important and influential turning point for #ourNHS. This will then be closed by a Plenary Session. A finalised agenda will be published at: www.healthcampaignstogether.com and a detailed leaflet for the event which we encourage you to print and share is available for download or in printed form. Help with travel costs: We will contribute towards costs of long distance public transport from the North, Devon and Cornwall. Organisations not yet affiliated or subscribing to the paper (new Issue 8 now available online & printed copies from Saturday) are encouraged to do so. We very much look forward to seeing you Saturday 4 November and building on our ever-increasing strength.